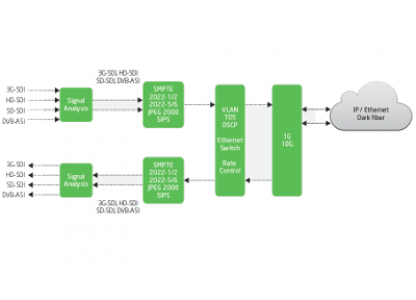 Bi-directional uncompressed 4 channel ASI/3G/HD/SD-SDI over IP/Ethernet with Low latency JPEG 2000 compression for 1 GigE and 10 GigE Networks. The VS902 provides linear encapsulation of uncompressed SD-SDI, HD-SDI, and 3G-SDI signals and also encapsulates DVB-ASI signals. In addition, the VS902 provides the highest quality JPEG 2000 compression for contribution video over bandwidth limited circuits. With the VS902, users can deploy multiple video circuits in point to point local loop applications or over long-distance packetized networks. This flexible platform enables highly cost-efficient video transport over a common unified platform accessing virtually any environment including long distance, metro area and campus networks.